The Four Seasons Resort at Jimbaran Bay is a luxurious beachfront retreat situated in 35-acres of secluded tropical gardens. The all-villa resort has been designed around a traditional Balinese village, offering spacious and comfortable accommodation that each offer an individual plunge pool. Indulge in authentic Indonesian cuisine at 'Taman Wantilan' while marvelling over the ocean views, or sip a cocktail or two at the chic 'Sundara', a beachfront spot with a beach club vibe during the day that transforms into an elegant eatery in the evenings. Complete your stay with a visit to the spa that offers magnificent massages and treatments, some of which can be experienced from a gazebo by the beach.The hotel has 156 villas. Visit this beachfront restaurant for a casual lunch with a beach-club vibe or sophisticated dinner, as the Sundara transforms into an elegant venue with lit fire pits by night. The menus of modern Asian-inspired cuisine feature an express lunch, dinner menu with a 'customised dining' concept, children's, cocktails and their much loved Sunday brunch. Reservations recommended, especially for groups and non-Resort guests. This oceanfront open-air pavilion restaurant showcases authentic Indonesian cuisine to enjoy alongside the stunning views. Breakfast menus feature an array of international favourites, with the option to start the day with local specialities. Partner refreshing drinks with a choice of light snacks, pizzas and desserts alongside Asian and Western choices. The Terrace Bar is the perfect spot for pre or post dinner cocktails and boasts uninterrupted views of the bay. 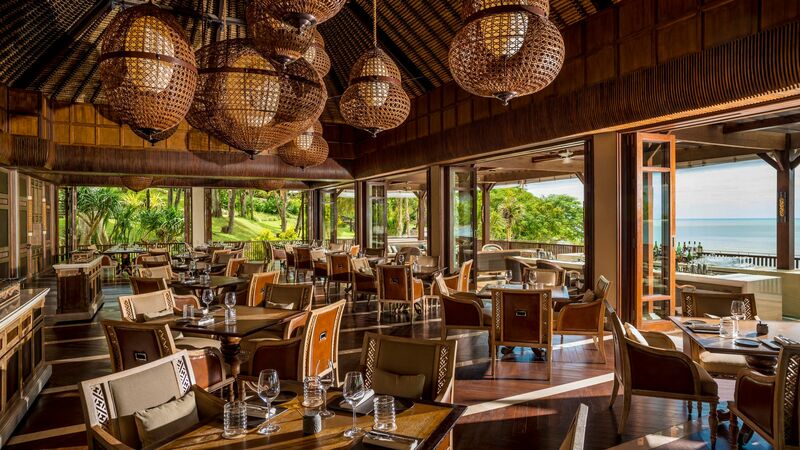 Suitably located beside the infinity pool, the open-air café offers light lunch options to enjoy with cool ocean breezes and extensive views of Jimbaran Bay. Reserved for Four Seasons Guests, this spacious beach features open-air gazebos, lounge chairs and day beds, making it perfect for a lazy afternoon. This three kilometre beach has the perfect waves for enjoying water sports, including stand-up paddle boards, windsurfing and snorkelling. 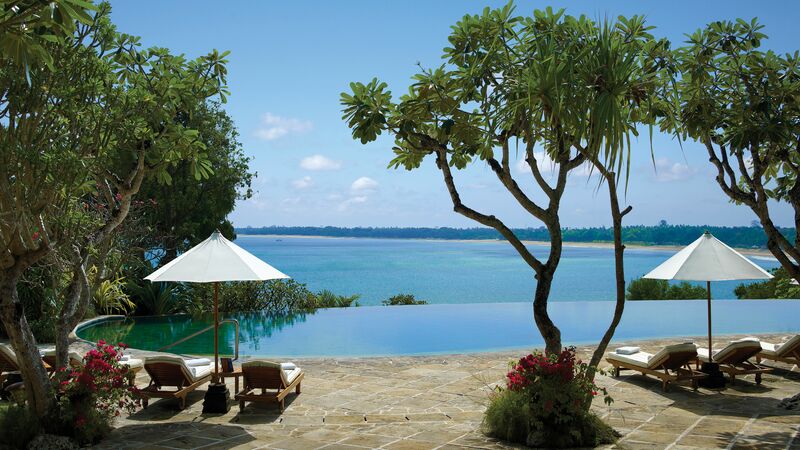 Cool off in a stunning infinity pool set on a spacious stone terrace with comfortable lounge chairs and umbrellas. Relax while pool attendants offer complimentary sun cream, fresh fruits, cold towels and ice cream. Using treatments inspired by nature and traditional Balinese techniques, the Four Seasons spa is the perfect place to relax. Choose from a vide variety of techniques including RWA Binada, a warm and cool marble stone massage known to balance the yin and yang energy within. Four Seasons also boasts a fitness centre, fully equipped with a state of the art fitness equipment, including a free weights gym, sprung floor aerobics studio and cardiovascular machines with individual TV monitors. Jimba Club welcomes four to eleven year olds to enjoy a range of activities. From crab hunting to kite flying, Jimba club is the perfect place for children to make new friends and try new things. From beach games to Surya Namaskara yoga, there is always something to do at the Four Seasons Jimbaran Bay. 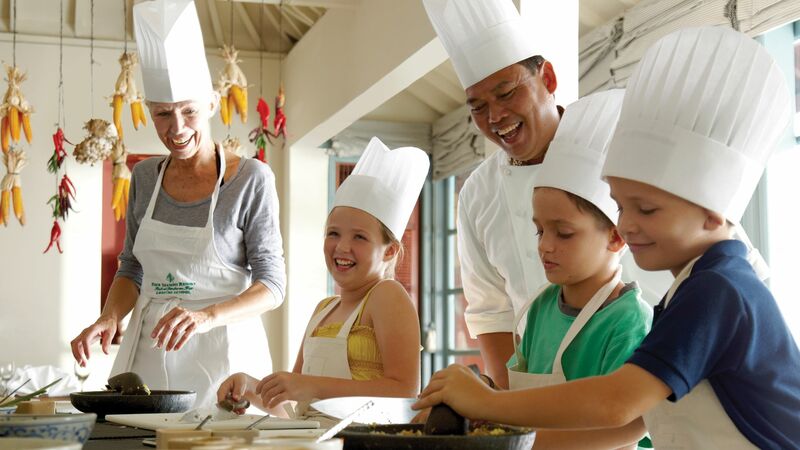 Join the Jimbaran Bay cooking class and discover secret local cooking techniques or learn how to make sweets in a Balinese sweet making class. There is even a cultural centre dedicated to exhibitions and workshops in Balinese art. There are a range of water related activities for guests to enjoy including hobie cat sailing, wind surfing, ocean kayaking and Catamaran sailing in Jimbaran bay. Local charges may apply. Just south of Kuta on Bali's west coast sits Jimbaran Bay, where five-star resorts blend seamlessly with the easy-going atmosphere of the local community. It's famous for its fantastic beach – a postcard-come-to-life affair with an amazingly smooth, flat sweep of sand fringed with a score of grilled seafood restaurants - a tribute to the tiny fishing village of old. It's the done thing in Jimbaran Bay to select your pick of the day's catch and dine right on the sand, with the waves at your feet. Slightly more inland, you'll find a maze of streets and alleyways, fresh produce stalls, and a bustling fish market to the north. Eighteenth-century Pura Ulun Siwi is one of the area's most significant temples, soaring out of the water in black stone. A real insight into Balinese religious culture, the temple hums with activity on holy days as incense is lit and traditional ceremonies are performed. Garden Villa's measure 250m² and are located in the centre of the resort surrounded by stunning tropical gardens. Each villa features a beautiful infinity-edge pool, a private dining pavilion and gorgeous oriental furniture throughout. Facilities include an LCD TV, minibar, beach bag, separate rain shower, oversized-tub, complimentary newspapers and a butler service on request. Jimbaran Bay Villas measure 250m² and are located in the centre of the resort with a partial ocean view. Each villa features a beautiful infinity-edge pool, a private dining pavilion and gorgeous oriental furniture throughout. Facilities include an LCD TV, minibar, beach bag, separate rain shower, oversized-tub, complimentary newspapers and a butler service on request. Deluxe Villas measure 280m² and are located in the centre of the resort with a partial ocean view. Each villa features a beautiful infinity-edge pool, a private dining pavilion and gorgeous oriental furniture throughout. These villas also feature a large indoor living area and a poolside bale. Facilities include an LCD TV, minibar, beach bag, separate rain shower, oversized-tub, complimentary newspapers and a butler service on request. Premier Ocean Villas measure 300m² and are located high among the hills with an incredible panoramic ocean view. Each villa features a large and beautiful infinity-edge pool, a private dining pavilion and gorgeous oriental furniture throughout. Facilities include an LCD TV, minibar, beach bag, separate rain shower, oversized-tub, complimentary newspapers and a butler service on request. Facilities include an LCD TV, minibar, beach bag, separate rain shower, complimentary newspapers and a butler service on request. Family Premier Villas measure 320m² and are located on the hillside amongst the resort gardens with great views over the ocean. The large infinity-edge pool and private dining pavilion are secluded by the walled tropical gardens ensuring ultimate privacy. There s also a spacious interior with a master bedroom and en-suite bathroom which adjoins to the children's room. If you are looking for an amazing Bali experience not far from the airport and a million miles from care. This is it. Jimbaran Bay has always been a special spot. The hotel has grown over time and is simply brilliant. The infinity pool near the beach and restaurant and bungalow bar are divine. oh and if the kids feel like trying surfing it?? ?s a great beach break only 2 foot waves. plenty of boards to rent. The Four Seasons and it's staff can only be described with one word, Phenomenal. They were prompt, knowledgeable, and went above and beyond to ensure we were happy during our stay. The concierge desk will help you with anything from booking taxi's to delivering things like contact lens solution (when it was seized by security in Singapore). The hotel has a beautiful bar and restaurant and beach access along with a beautiful villa with a pool and typical four season aesthetics and yes hospitality which is absolutely unbeatable. I love the lobby and public area and probably the best breakfast place in india. 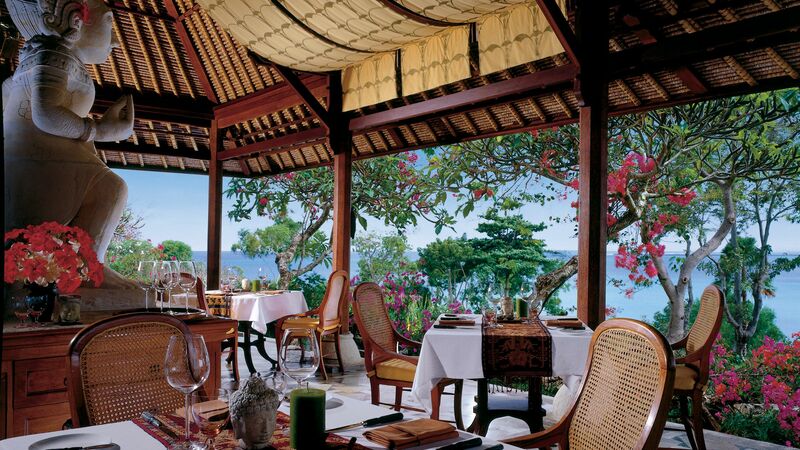 “ The Four Seasons Jimbaran Bay is outstanding! We were blown away with the service we received during our stay, every single staff member seemed genuinely invested in the quality of our stay. The rooms are stunning, the restaurant is fabulous, there is plenty to do. We will definitely be back. Our only regret was leaving here to go to another villa, we wish we had stayed on! As far as luxury resorts go, we found the Four Seasons Bali extremely good value.